Sigrid Thornton at the Melbourne Cup Carnival's Derby Day. Sigrid Thornton at the AFI Awards. Sigrid Thornton at the Myer marquee attends The Melbourne Cup. Sigrid Thornton at the 6th annual Lexus If Awards. 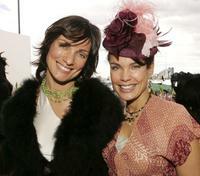 Sigrid Thornton and Catherine McClement at the Myer marquee attends The Melbourne Cup. Sigrid Thornton at the press launch for "The Blue Room" play. Sigrid Thornton at the Helpmann Awards 2003. Sigrid Thornton and Marcus Graham at the stage for David Hare's "The Blue Room." Sigrid Thornton at the 2004 Astra Awards. Sigrid Thornton at the 2006 Hisense Inside Film Awards. Sigrid Thornton at the 2006 Australian Screen Directors Association Awards. Sigrid Thornton at the 2007 Red Ball. Sigrid Thornton at the 2003 LEXUS IF (Inside Film) Awards. Sigrid Thornton at the 47th Annual TV Week Logie Awards. Sigrid Thornton attends the L'Oreal Paris 2005 AFI Awards Nomination announcement. Sigrid Thornton and Claudia Karvan at the L'Oreal Paris 2005 AFI Awards Nomination announcement.